Stacey Robbins Interview - Dr. Nikolas Hedberg, D.C. In this episode of The Dr. Hedberg Show I interview Stacey Robbins! This was a very unique interview because we didn’t focus on biochemistry, but rather how Hashimoto’s can affect your life and your relationships. 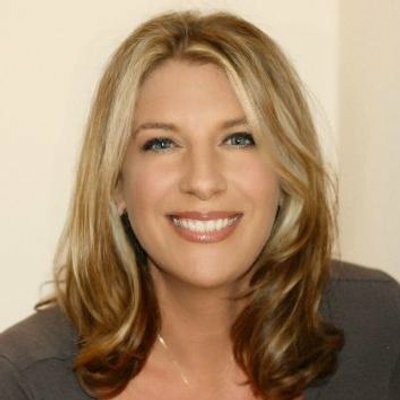 is an award-winning Author, Speaker, and Integrated Wellness Coach. She is honored to work with senior executives in global organizations and is a trusted advisor to influential thought leaders, film producers, authors and creators who make a major impact in the world through their work. Stacey took a diagnosis with an autoimmune condition, Hashimoto’s – where the body attacks the thyroid — and turned it into an opportunity to look behind the scenes at where she was at war with herself. Traveling around the country for years to study and attend conferences, Stacey learned more about the mind, body, spirit connection, which allowed her to dive into the thoughts, patterns, and beliefs that were undermining her health. 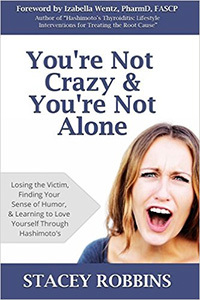 Her book, ‘You’re Not Crazy and You’re Not Alone: Losing the Victim, Finding Your Sense of Humor and Learning to Love Yourself through Hashimoto’s’(with a foreword by Dr. Izabella Wentz) is Stacey’s funny, honest, and soulful journey, to not only heal from the physical part of Hashimoto’s, but to address the inner work and healing that is available to every woman with Hashimoto’s. Giving back to the community is a core value as Stacey serves on the Board of Directors for Hashimoto’s Awareness, an organization that educates and empowers the Hashimoto’s community in the areas of testing, self-care, and healing. At Hashimoto’s Awareness, she works alongside esteemed experts in the field of Thyroid health: Dr. Izabella Wentz, Mickey Trescott, and Dana Trentini (a.k.a. Hypothyroid Mom). -How Stacey got connected to Hashimoto’s. -The top three messages women should know from reading Stacey’s book. 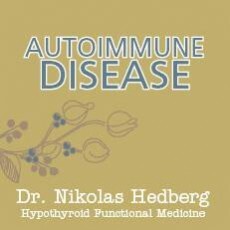 -How relationships are affected with your spouse or partner, when you have an autoimmune condition. -Helpful tips for both of you to have when dealing with Hashimoto’s. -How Hashimoto’s affects being a parent. -How Stacey’s life and lifestyle changed by having Hashimoto’s.